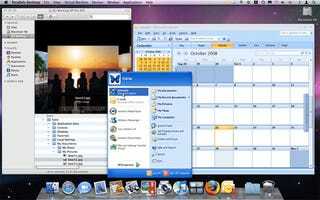 VMWare Fusion vs. Parallels Desktop for Mac: Which Is Faster? Ironically, it's one of the biggest decisions you make when you get a Mac: How should I run Windows on it? Parallels or Fusion? An exhaustive battery of benchmarks by MacTech reveals a clear winner. The short story is that in most cases, Parallels runs a solid 14-20 percent faster than Fusion, except in the rather limited scenario of running Windows XP 32-bit on two virtual processors. Overall, running 32-bit Windows OSes with a single virtual processor, Parallels is 14 percent faster; with two virtual processors, Parallels is 20 percent faster with Vista, while Fusion is 10 percent faster with XP; and for 64-bit Vista, Parallels is 15 percent speedier. Depending on the task, the numbers vary—like transcoding MP3s can be up to 30 percent faster on Parallels.